About half of all Facebook users have unwittingly been assigned a “political label” by the social network. But when told, most believed the classification represents them accurately. That is among the top findings from a new study of Facebook’s algorithms and its users’ personal data, being released today by the Pew Research Center. The study asked a sample of nearly 1,000 U.S. adults if they were aware of, understood and were OK that Facebook maintains lists of their personal interests and traits, so advertisers can target them. Three-quarters (74%) of the respondents said they were not aware of the practice, and when informed, about half (51%) were not comfortable with it. More than one-quarter (27%) said they did not feel Facebook’s data accurately represents them. The majority of Facebook users have 10 or more categories listed on their ad preferences page. 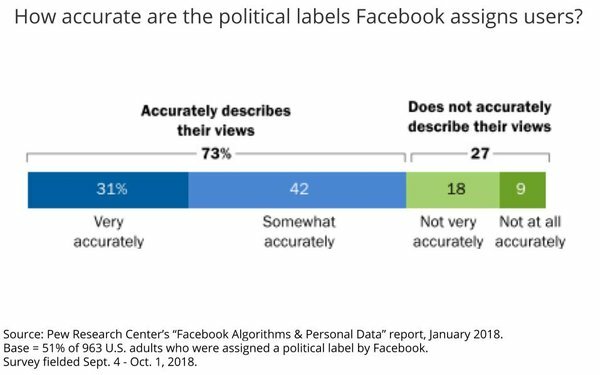 Facebook assigned political labels to 51% of the respondents, and 73% of them said they were accurately represented by them. “There is some variance between what users say about their political ideology and what Facebook attributes to them,” the Pew report found. “Specifically, self-described moderate Facebook users are more likely than others to say they are not classified accurately.